Daily Bitcoin is in the headlines, positive sentiment is intact, and the price is in an uptrend after its recent correction. Consider that 59% of last year’s ICO’s have failed or are failing, encouraging some triumphant “I told you so!” from skeptics who now leer at quieted Twitter accounts, downed websites and other digital boneyards of those looking to cash in on the boom. To be sure, both the Bitcoin Bulls and Bears have plenty of support to lean on. There was another recent high-profile theft, with Japanese exchange Coincheck confirming the loss of more than $500-M worth of digital coins. There was the death of a SKorean regulator looking to crack down on cryptocurrencies. And crypto prices in general seem to be correlated with stock prices and may be vulnerable to monetary policy tightening worldwide. Positives include more governance/network/hard fork-related progress, with “Bitcoin Core” rolling out Segregated Witness (SegWit) in an effort to correct glaring inefficiencies in the transaction network. And, earlier this week, the purchase by Goldman-backed Circle, a money transfer app, of crypto exchange Poloniex for about $400-M.
Goldman’s take is that Bitcoin is likely in a bubble, that the underlying blockchain technology holds promise, and that Bitcoin enjoyed characteristics that were uniquely conducive to the current speculative mania. They view Bitcoin as comparable to the Mosaic web browser and the Alta Vista search engine, which popularized internet access and search but eventually lost their 1st-mover advantage to Netscape and Google. Amazon’s (NASDAQ:AMZN) recent ability to barge its way into established areas like streaming television and meal delivery also shows that being 1st in something is no longer the boon it once was—especially with bitcoin’s meteoric price rise late last year revealing structural flaws, including inefficient payment settling, vulnerability of centralized exchanges, and the inappropriateness as a means of exchange for day-to-day transactions, given the extreme price volatility. Instead, Bitcoin morphed into a near-term store of value powered by far-off hopes of widespread adoption and dominance. The technology was vague and amorphous enough that proponents could ascribe near-mystical qualities when the reality today is a hackable, unregulated, shadow banking alternative with a reputation for funding the despicable. And unlike any other commodity supply could not react to higher prices by increasing output. When more miners want more Bitcoin, the hash rate will scale difficulty. Thus, the rate at which new Bitcoins are “discovered” is kept relatively stable at about 75 per hour. But the rush by miners makes the Bitcoin network massively power-hungry, carbon-intensive and, frankly, unsustainable, with its power consumption expected to match current worldwide levels by early 2020. The Big Q’s: Is Bitcoin a bubble or has market structure problems, and will today’s cryptocurrencies exist 5 or 10 years from now. The Big A: Possible, not probable, as a better implementation of blockchain technology will play a larger role in the economy. 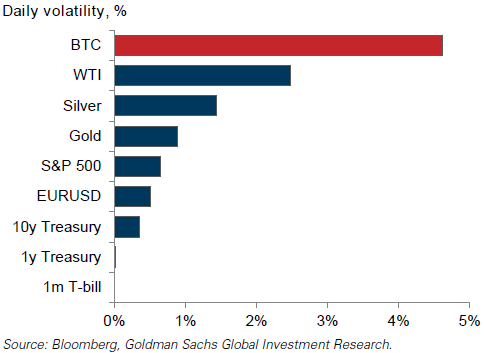 As a result, the cryptocurrencies that do not survive are likely to “trade to Zero,” a risk that Goldman’s analysts believes is underappreciated now. At the other end of the spectrum, CEO of crypto-focused investor Pantera Capital, believes Bitcoin’s fair value could be approximately $500,000, per the Goldman note, based on his estimates of market share capture from areas of disruption, including international money transfers, credit card transactions, Bold and other wealth stores, and fiat currencies. If you are going to invest in this space diversify a portfolio to see a couple of truly transformative winners, as many may be big losers.